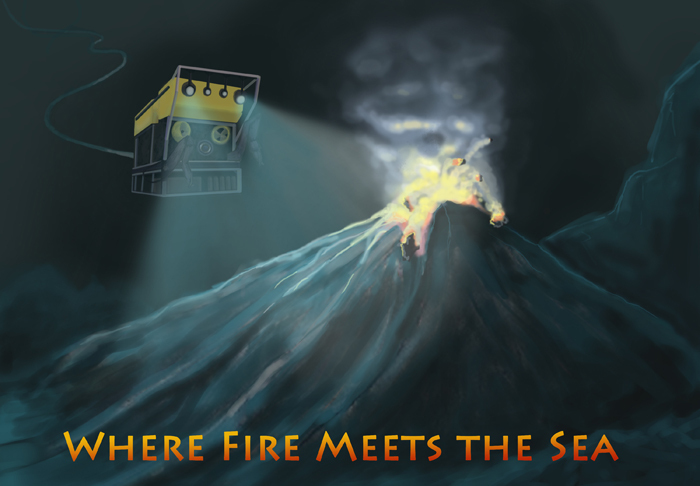 Volcanologists use undersea robots to chart explosive eruptions in the deep ocean. Tanya Lewis plunges to the fiery depths. Illustrated by Calene Luzco and Kat Cantner. Bobbing at sea on the Western Flyer, scientists huddle inside a darkened control room. They gaze at a wall of video monitors and exchange hushed words over headsets. Two men in black leather chairs clutch joysticks, each twitch of their wrists conveyed at light-speed by cable to a robotic vehicle hovering four kilometers deep, like a leashed dog awaiting its owner’s command. The robot’s lighted cameras peer at a volcanic Atlantis of a seamount. Now slumbering, this volcano once was a roiling cauldron, spawning slabs of new earth. Eighty percent of our planet’s volcanic activity takes place in the oceans, yet we know little about underwater volcanoes. Geologist David Clague leads expeditions to explore these murky realms using underwater robotic vehicles. 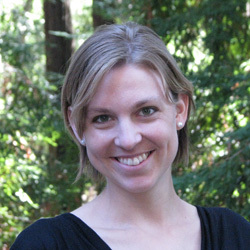 Clague, a scientist at the Monterey Bay Aquarium Research Institute (MBARI) in Moss Landing, California, wants to understand the forces that make some eruptions explosive and others more tame. One of the biggest questions in explosive eruptions—like the one that blew up Mount St. Helens in 1980—is how the newly erupted lava shatters into pieces. During eruptions above water, lava rocks grind each other up and gases in the magma quickly escape, destroying evidence of these violent formative stages. But in the ocean, water cushions the rocky spin cycle action, preserving clues about how the eruption started. It’s the ideal volcano laboratory—if one could only get there. “The ocean is good at hiding its secrets,” says geologist William Chadwick of the National Oceanic and Atmospheric Administration (NOAA). “The damn ocean, you can’t see through it to know what’s going on at the bottom.” Nevertheless, he and Clague have made it their life’s work to find out. During the past decade, Clague has discovered that explosive undersea eruptions occur deeper than most scientists thought possible. 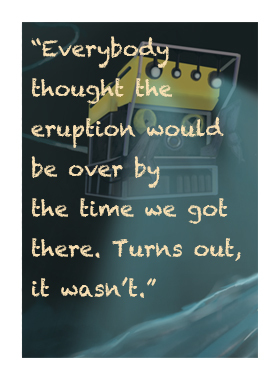 On the ocean floor, his team has found glassy bits of volcanic rock that suggest gases released from magma drive these violent blasts. This hypothesis, gaining in traction, cuts to the heart of the tempestuous processes that sculpt our planet’s geography. Both land volcanoes and underwater ones owe their existence to plate tectonics, the motions of the majestic puzzle pieces of Earth’s crust. Plates collide, sliding under one another to form mountains like the Andes; they drift apart, like the spreading Mid-Atlantic Ridge fueling the disruptive 2010 eruption of Iceland’s Eyjafjallajökull volcano; and they leak through when superheated magma creeps up from Earth’s mantle to create hotspots, like the one churning out the Hawaiian Islands [see sidebar: Life of a Hawaiian Volcano]. In shallow water, volcanoes may announce themselves by blasting up steam and bits of rock. But most are hidden from view kilometers below the surface, detectable only with sensitive microphones. “They have a certain way their stomachs growl before they erupt,” Clague says. That growl might foreshadow a gently effusive eruption or a mighty explosive one. 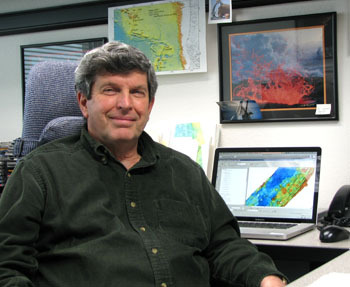 Clague’s office at MBARI reveals a neatly catalogued passion for volcanoes. Shelves of rocks and pictures of fountaining lava adorn his walls. He gestures proudly at colorful maps he has produced, which trace the topography of the ocean floor at an impressive 1-meter resolution. Beneath his genial manner, Clague harbors a razor-sharp attention to detail. By some quirk of his brain, he has a photographic memory for everything he has seen: every microscope slide, every map, every field location. He says he keeps a file of these pictures in his head, a skill that comes in handy for helping biologists identify new species in the deep sea. “When nothing matches in the files, it’s almost invariably something new,” he says. One member of Clague’s team bears most of the credit for these mysterious views of the deep ocean. He’s bulky and rather awkward on land, but plop him into the water and he glides like a ballerina. His name is Doc Ricketts, after the character Doc in John Steinbeck’s Cannery Row—and he’s a black-and-yellow robot. The size of a large car and weighing six-and-a-half tons, Doc Ricketts is the Zeus of remotely operated vehicles (ROVs). Aboard MBARI’s 35-meter twin-hulled research ship, the Western Flyer, the Doc looms impressively from a crane winch when not in use. Equipped with several broadcast-quality cameras and high-power lights, the bot has a giant float pack to keep him buoyant underwater and seven thrusters to maneuver. But his most impressive features are his two claw-like gripper arms, used to collect lava rock and animal samples. The Doc cost $5 million, and missions aren’t cheap, either: It costs about $25,000 per day to run the ship, according to Clague. “That’s about $500 per rock,” says postdoctoral researcher Ryan Portner. With a price tag like that, piloting the ROV is best left to professionals. During a dive, the winch lowers the ROV down through trapdoors in the ship’s belly. It takes up to two hours just to reach the bottom. Dives last between eight to ten hours on the bottom, with the pilots rotating through shifts. The control room is the hub of activity as the scientists guide the exploration of the seafloor below. Down at the bottom, it’s pitch black and the pressure is crushing. That’s no problem for the ROV, which illuminates a small swath of ocean in front of it and records video footage continuously. The team has logged hundreds of thousands of hours of tape underwater, retrieving countless rock samples to analyze in the lab. Submarine volcanoes also support some of the world’s strangest biological communities, where chemical vents replace sunlight as the main energy source. “We get to see animals that nobody’s seen before,” Clague says, such as red jellies, carnivorous sponges, and a starfish named after Clague himself, Evoplosoma claguei. Yet Clague’s primary interest is collecting volcanic rock and sediment samples. Historically, scientists believed the driving force for explosive eruptions was steam, formed when seawater encountered scorching magma. Most researchers believed such violent eruptions couldn’t happen deeper than about 500 meters, because the intense water pressure prevents steam from expanding appreciably. But for years, Clague has steadily built evidence for such deep-sea pyrotechnics—some of which have now been caught on video. An eruption down there is like opening a bottle of soda, Clague says. The gas (mostly carbon dioxide) is under pressure, but when you open the lid, bubbles form as the gas expands and escapes. If there’s enough gas in the volcano-soda, it will overcome the water pressure and vent explosively. “At first, I sort of followed the gospel,” Clague says. He reasoned that the lava may have oozed out slowly, like toothpaste, forming glass where the molten flow reacted with seawater. But he wasn’t completely satisfied, so he decided to look somewhere deeper. He led an expedition to the Gorda Ridge off of northern California in 2000, collecting cores of sediments at a crushingly deep 3,800 meters. 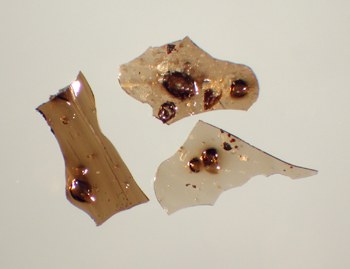 “Every core was full of little glass fragments that said, ‘explosive eruptions have been going on,’” Clague says. Because steam can’t form at that depth, he believed the driving force was large burps of carbon dioxide gas expelled from the magma. He has collected many more limu o Pele samples since. “My lab is just full of little vials of glass particles,” he muses. Clague’s findings challenged the conventional wisdom that magma did not contain enough gas to cause such volcanic fireworks at these depths. James White, a geologist at the University of Otago in New Zealand, maintains that steam formation still could—and did—play a role at some of the explosive sites Clague has studied, possibly in combination with gas in the magma. “The effects of water itself on an eruption are not well understood,” says White. Even at greater depths where steam doesn’t contribute much to the explosivity, the scale of eruptions is much smaller than those on land, White says. But evidence continues to mount that the deepest eruptions are driven solely by trapped gas. In 2007, scientists found limu o Pele fragments at the Gakkel ridge in the Arctic Ocean, about 4 kilometers deep. The bubble fragments were “incontrovertible evidence” of explosive eruptions, says geologist Robert Sohn of the Woods Hole Oceanographic Institution (WHOI) in Massachusetts, who led the expedition. As the site is well below the so-called “critical point” where seawater can form steam, stored gas in the magma must have been at work. 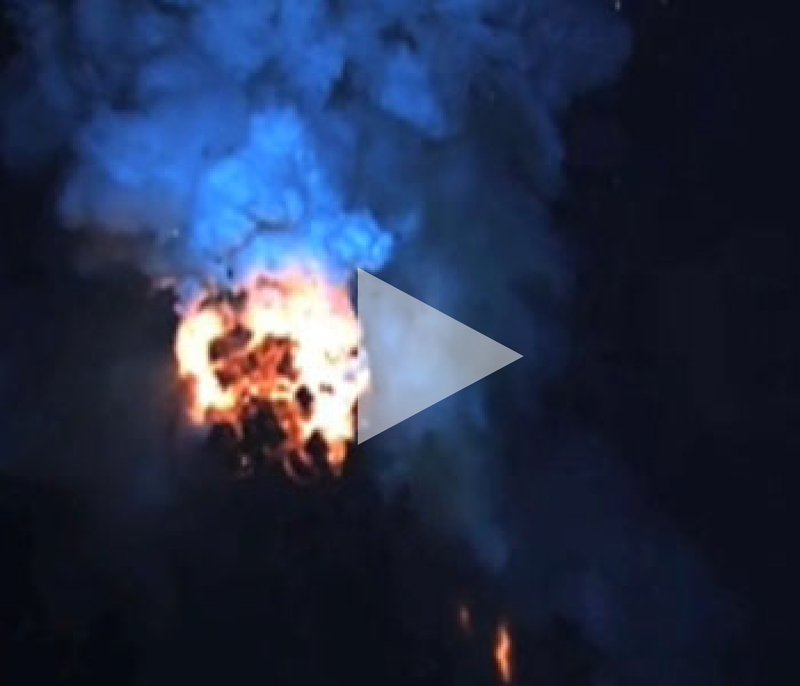 Video taken by an ROV shows mushroom clouds of bright-orange magma and sulphurous smoke belching from the deep-sea floor. Glowing bubbles rise from this portal to Earth’s molten interior, trailing charred debris. Watching the eruption in real-time, Clague says he felt vindicated. This was just the second observed deep-sea eruption; William Chadwick’s team at NOAA had glimpsed the first one five years earlier, at the Northwest Rota Volcano near the Pacific Ocean’s Mariana Island Arc. Physical volcanologist Adam Soule, also of WHOI, has analyzed the amount of gas in rock samples from the West Mata eruption. “There’s some discussion still to be had in role of seawater,” he says, but gas release clearly had a part in it. The team has extensively mapped the Juan de Fuca Ridge, a 500-kilometer-long mountain chain off the coast of Oregon. At this site, the Pacific and Juan de Fuca plates are spreading apart. Magma wells up from Earth’s molten mantle to form new crust, even as older parts of that crust plunge beneath Oregon and Washington to fire up the Cascades Volcano range. Both Clague and Chadwick study a volcano at the spreading ridge called Axial Seamount. In 2009, Chadwick’s group forecast that Axial would erupt by 2020. When they returned to the seamount in 2011, they noticed some of their instruments had stopped working. When they sent an ROV down to inspect the instruments, the problem was clear: One of the instruments was sticking up out of a fresh lava flow. Axial had erupted only months earlier. Clague, who happened to be on an expedition nearby, heard the news and redirected his plans to map the new flow with his team’s AUV. Because they had mapped the area previously, they could compare the “before” and “after” maps. His team thinks the 2011 eruption was probably quick, given how thin the lava was. The scarcity of glass fragments suggests this eruption wasn’t very explosive, though older flows hint that Axial has had its share of drama. Clague’s team is now continuing its explorations at the northernmost East Pacific Rise, south of Baja California, Mexico, where they plan to map the history of the entire ridge. We’ve been at sea under a star-speckled predawn sky for about an hour when a corona-colored glimmer appears on the coastline up ahead. As we approach, the glow becomes a blazing lava torrent carving a fierce path to the ocean. The boat takes us closer, until I smell the acrid volcanic gases and feel their warmth on my skin. Cascades of lava spill over the whole expanse of jagged cliff, pouring into an ocean that surges up to meet it in a violent kiss of fire and water. We’re at Kilauea volcano on the Big Island of Hawaii, where I grew up. The youngest of the Hawaiian Islands, the Big Island is part of a chain of some 125 volcanoes stretching 6,000 kilometers northwest across the Pacific. The islands formed as the Pacific Plate migrated over a hot spot in Earth’s mantle. Each provides a snapshot of a volcanic island’s life, from creation to erosion to reclamation by the sea tens of millions of years later. The Big Island began as a seamount like its neighbor Lo’ihi to the southeast, which will break the surface as a new island several hundred thousand years from now. 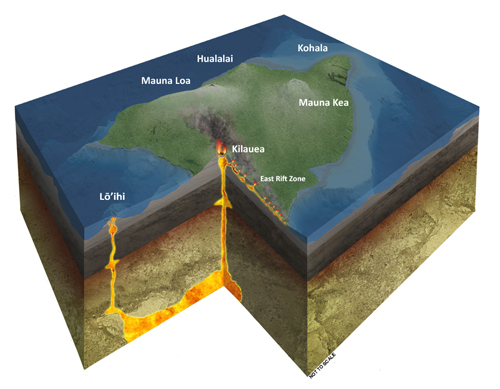 As the forming Big Island approached sea level, its volcanoes became more explosive. They entered a “shield-building phase,” so named for their shield-like shape, accumulating new mass and coastline just as I observed at Kilauea. Mauna Loa, our other shield-building volcano, slumbers lightly for now. Next, these volcanoes will enter a dormant, post-shield stage as they drift away from the hot spot, like the mighty Mauna Kea and Hualalai mountains whose contours I know so well. These will inevitably erode and go extinct, like Kohala mountain, on whose gentle slopes I spent my childhood. Some volcanoes undergo a rejuvenation stage with a “last burp” of eruptions as much as a million years later, as did the famed Diamond Head cone on Oahu. Eventually, each Hawaiian Island will sink into the crust under its own weight and become an atoll, ringed by coral reefs. Finally, the coral reefs will die and the atoll will subside to become a seamount. The island I call home will become just another blip in the span of geologic time. Story ©2012 by Tanya Lewis. For reproduction requests, contact the Science Communication Program office. When I think about my ideal career, I think of the Horse Whisperer. No, I don’t want to lead a reclusive life communing with animals. But I do want to serve as interpreter for a group of creatures most people don’t understand. I am talking, of course, about scientists. I grew up on the slopes of Mauna Kea on Hawai'i, in view of the world's largest telescopes. But in college and later at a German research lab I set my sights inward, on technology that decodes brain signals. One day, this may help people with paralysis regain mobility. It’s the closest we’ve come to psychokinesis, and dry scientific prose doesn’t do it justice. I want to furnish such science with the rich narrative it deserves. I'm no Horse Whisperer, but I'll happily answer to Nerd Interpreter. On July 27, 1987, my parents propped me on their laps to watch the Discovery Channel air its first-ever Shark Week episode. Little did they know this moment would foster years of shark-themed birthday parties, allowances spent on "Adopt a Whale" campaigns, SCUBA diving lessons, and a college send-off to a university where I could learn more about marine science. After a field quarter studying soldierfish in Moorea, French Polynesia, followed by a second field quarter studying the vertical distribution of invertebrates on giant kelp in Monterey, I realized that there is a lot of important and even critical research that happens, yet the results are seldom effectively communicated to the public. 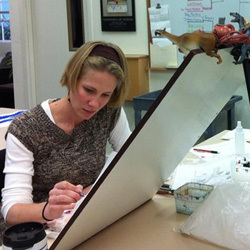 This is when I decided to divert my career to science illustration. I wish to contribute to bridging the gap between science and the public, in hopes that it will inspire further involvement in the sciences and motivate conservation efforts. During my internship at Point Defiance Zoo and Aquarium, I will be working to create species identification cards in the aquarium. The focus will be on marine fish and invertebrates of the Pacific Northwest region. To see more of my work, please visit my website. My academic background is in the Earth sciences and cultural history with a focus on science education. 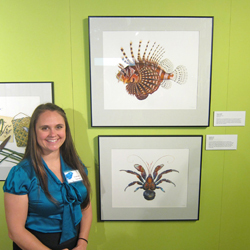 Through my illustrations I hopes to engage the community in scientific dialogue and encourage curiosity about the natural world. You can view more of my work at my website.